Does calling far-right parties 'populist' legitimise them? Far-right politician Norbert Hofer just missed being elected Austria's new president by a whisker. Is it time to reflect on how European society is implicitly accepting nationalist extremism? 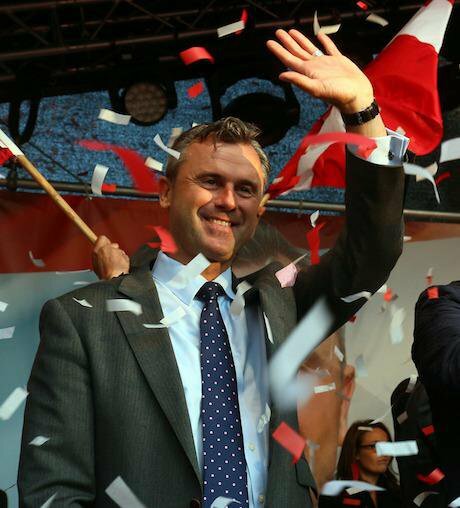 Norbert Hofer candidate for presidential elections of Austria's Freedom Party. Credit: Ronald Zak/AP/Press Association Images. All rights reserved.He campaigned on a platform of stopping the "Muslim invasion" and proposed building a wall on Austria's southern border to keep migrants out. Some have called him Austria's Donald Trump. But Norbert Hofer of the Freedom Party, who was for a long time, the frontrunner in Austria's presidential elections last month, is also famously thoughtful and soft-spoken. He denies being right-wing and his election posters proclaimed him 'Stimme der Vernuft' or the voice of reason. When Hofer lost by a whisker (the Freedom Party recently lodged a legal challenge to the result), newspaper articles across the world proclaimed variations on "phew" and "Europe breathes a sigh of relief". At the last moment, Austria opted for pro-refugee, ex-Green Party leader Alexander Van der Bellen. But Austria remains a country politically split down the middle between discontented working classes and comfortable urban elites and Hofer's narrow defeat is damaging for democracy in Europe. The millions of votes secured by the Freedom Party (FPO), and similar groups across Europe, raises several questions. How this could happen and is it all about 'immigration' or 'refugees'? What does it tell us about the ways in which European society is implicitly accepting the rise nationalist extremism? Austria is an interesting case. In previous decades, the Freedom Party not only found seats in governments and in regional coalitions, but, like other similar parties almost everywhere in Europe, it was also able to influence politics and legislation from the opposition. Centrist governments, in fact, restricted labour immigration, hardened citizenship applications for migrants and, very recently, tried to restrict access to the Brenner Pass (a mountain route on the border between Austria and Italy), threatening to build a fence to stop asylum seekers and refugees moving towards northern Europe from the Mediterranean. This has a relevant impact on international relations and the working of the European Union. It naturally caused tensions with Italy, with Freedom Party chairman Heinz-Christian Strache calling the Italian prime minister Matteo Renzi a “state trafficker” (of migrants). Germany strongly disagrees with policies such as border closing, while EU Commission president Jean-Claude Juncker considers it a “political catastrophe” for a united continent. Yet, this did not help the government to get any impressive electoral results in the presidential ballot. There is, nonetheless, another side to the story. It goes beyond Austrian voter dissatisfaction with the (usual) ruling elites, the evident inabilities of the present government, clientelism, and the fear of further losing national sovereignty. Instead, it discusses how conditions have allowed the far right to rise and flourish in politics and society. This is linked with how communities, their leaders and elites face narrow nationalist extremisms in a global era and economically interconnected world. It is indeed true that, as commentator Jeremy Cliffe pointed out, the Freedom Party “has long been tolerated by the Austrian establishment”. The New York Times went further, highlighting that the "far right has long had an institutional home in Austrian politics”. One reason is the nation's famously peculiar reading of its interwar history and involvement with far right-wing movements. It considered itself as almost dissociated from German national socialism. Indeed, it was suggested that “public debates over the past in Austria not only failed to discredit movements like the [Freedom Party] but legitimated them”. When compared to countries like Germany, for a very long period in the postwar years, “the far right found a more hospitable political environment”. This is not, by any means, an isolated example. Italy has seen a recent surge in support for far-right politics and this has hardly created a scandal. The Freedom Party's fellow party, the Lega Nord (Northern League), joined governmental coalitions in the past and still governs some important regions. Moreover, the party may realistically lead the 'moderate' centre-right alliance in the 2018 legislative elections. Unsurprisingly, since the 1990s, the country has seen a growing number of attempts to reconsider the history of Benito Mussolini’s fascism. You have politicians like the grand-daughter of Il Duce, Alessandra Mussolini, who has never hidden her admiration for the fascist leader who is, nonetheless, a very proactive voice in Silvio Berlusconi’s 'moderate' party. This is considered perfectly normal by the public and apparently never caused concerns at an EU level, including in the European People's Party (where Berlusconi is affiliated). In France, although the far right is out of (national) power, the national narrative for decades has maintained that the French have never had a real and significant fascist or neo-fascist environment. This was credited to the strength of French democratic values. Yet, politically, Nicolas Sarkozy pushed the moderate right further to the right on themes such as immigration and identity in an attempt to woo Marine Le Pen’s supporters. By looking at the recent electoral results and polls, it is, on the other hand, the Front National which is progressing. The reality today is that the far right is being legitimised in contemporary Europe, and there are no signs of any future improvement. This legitimisation is, in varying degrees -- and not necessarily intentionally -- carried out by the media, academics, and mainstream politicians. Has anyone wondered why these parties are happy to be called 'populists' with no mention of the suffix 'extreme/far/neo-fascist right'? This 'populist' categorization happens paradoxically even when parties such as the Belgian ally of the FPO, the Vlaams Belang, clearly labels itself as a 'nationalist party of the right'. This probably allows Hofer to claim that the FPO is not even “an extreme right-wing party”, but rather “a centre-right party with a high degree of social responsibility”. There are a number of other factors that generally explain the successes of the far-right since the 1990s, including globalisation, further European integration, (the decline of) national identity, unemployment, and, recently, the waves of refugees, the economic downturn, and austerity. Scholars and commentators have long debated the influence of each of these factors. But there is also a need to reflect how our European societies are now implicitly contributing to the cultural and political acceptance of this nationalist extremism.